Also known as the Snake-necked Turtle, this very common species spends most of its life in fresh water, and is most often seen crossing local roads after rain in search of new waterholes or nesting sites. The carapace (upper ‘shell’) is dark brown or black and up to 25 cm long. When disturbed, the turtle pulls in its long neck for protection to lie sideways between the carapace and plastron (lower ‘shell’, which is usually cream in colour). This turtle can also produce a strong musky odour when handled and can deliver a swift painful bite. 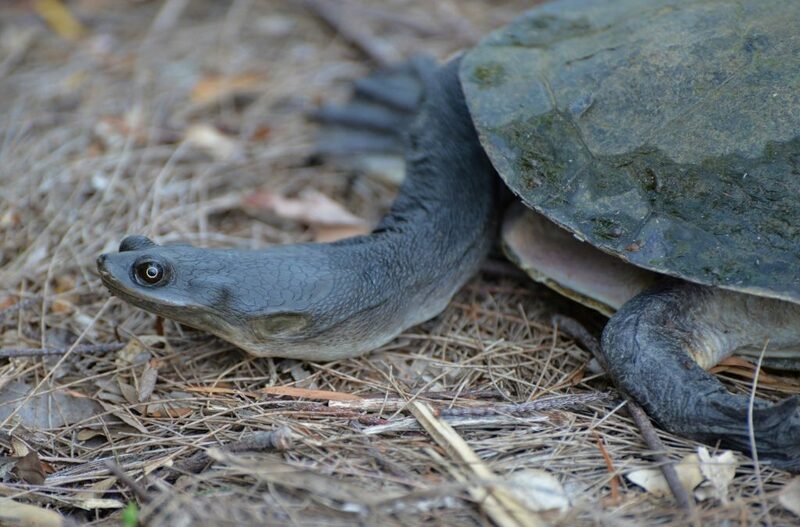 This long-necked turtle (the neck is almost as long as the carapace) prefers standing water such as the many dams on private properties in our district. It is an opportunistic feeder, taking small fish, tadpoles, yabbies, other invertebrates and frogs. It uses its powerful claws on the front webbed feet to tear apart larger prey items. In spring or early summer, the female lays 6 to 20 eggs in an excavation in the bank of a river or dam. The incubation time can range from 3 to 6 months and some females may lay up to three clutches in a year. The eggs are sometimes eaten by foxes, water-rats or goannas and the hatchlings may be taken by waterbirds or large fish. Turtles are fairly long lived, with the males taking 7–8 years to reach maturity and the females 10–12 years. Please be careful when driving not to run over and kill these important carnivores.